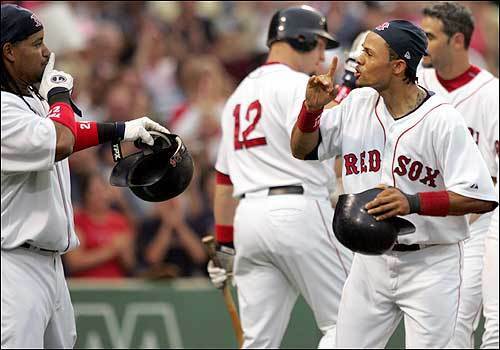 Boston's Coco Crisp, right, and Manny Ramirez signal quiet after Crisp hit a grand slam during the first inning against the Tampa Bay Devil Rays at Fenway Park on Thursday. Crisp's home run gave the Red Sox a 6-0 lead. The Red Sox went on to win, 15-4.